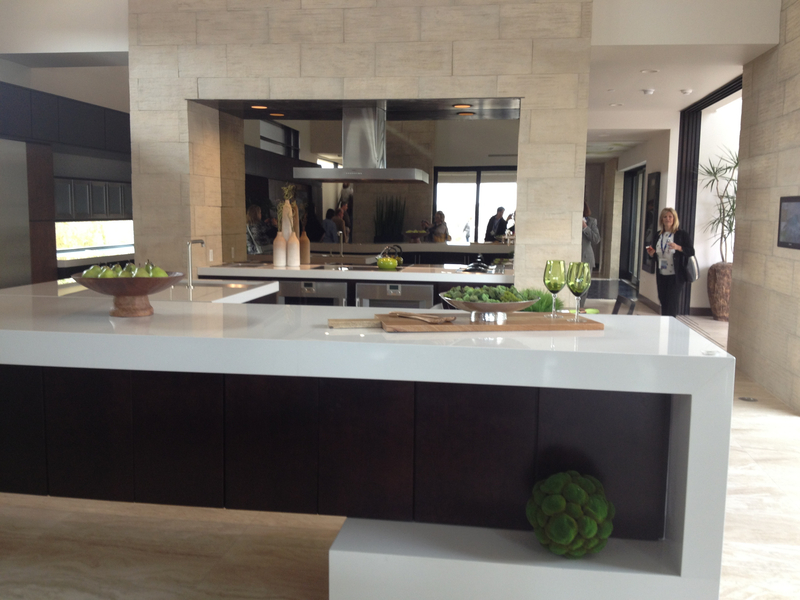 The Latest Trends in Kitchen Island Design Trade Lines for Curves and Mixed Materials for Monolithic. The latest kitchen design trend creating a buzz at the International Builders Show has to do with the shape and make of the kitchen island. Still a must-have in any modern kitchen, the island is softening its linear look with curves that allow for round-the-table seating instead of shoulder-to-shoulder. 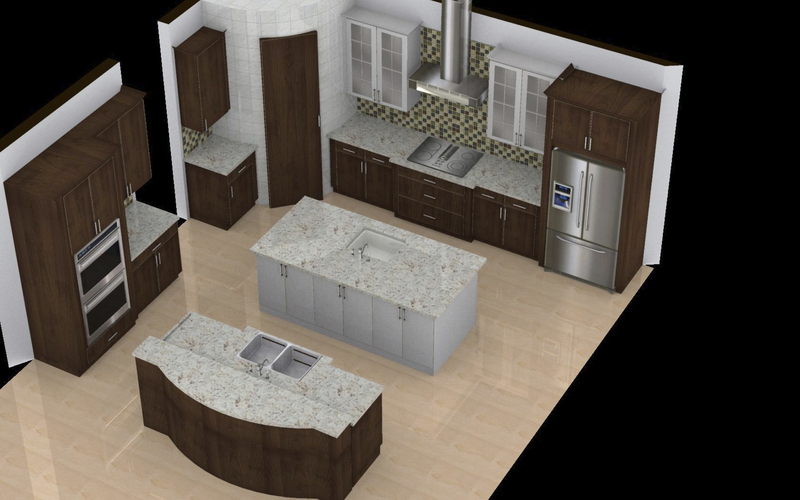 Countertops that wrap around the island base are showing up in the latest kitchen designs. It’s an aesthetic known as Monolithic. You’ll be hearing that word a lot in 2013. Monolithic design is defined as a single material that seamlessly wraps around a surface, wall, cabinetry or any other feature. 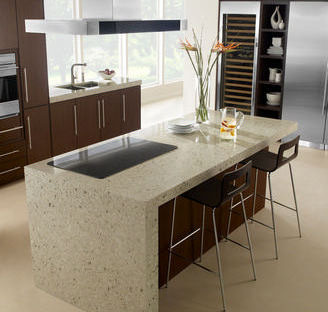 Some of the best examples are in the concrete surfaces of kitchen countertops, very on-trend this year. Concrete is a malleable material that can be sculpted and molded to create a seamless surface. 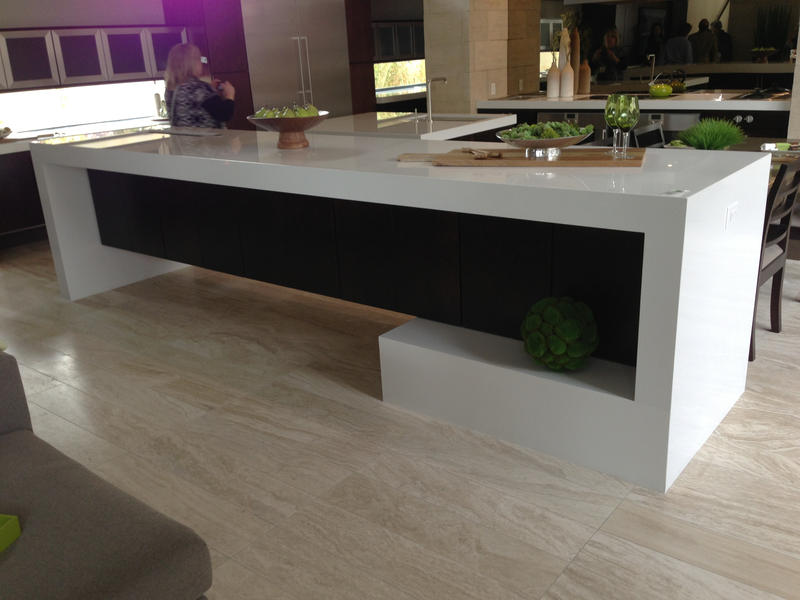 In this example picture above, Jorge designed two islands each with seven linear feet of countertop space that sit four feet apart. The inner island, located in the kitchen center, will be monolithic, made of wraparound Carrera marble with white cabinetry underneath. The island facing out towards the family room features the same white Carrera marble countertop but with an espresso wood cabinetry base to compliment the floor-to-ceiling fireplace in the family room. I love these ideas! I have seen similar countertops on HGTV. Beautiful!